these will not disappear once made. We can't promise that will be the last test. 2. 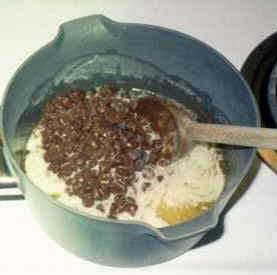 Cake: In extra large bowl, use mixer on low to beat cocoa and warm milk. Add buttermilk, oil, eggs, granulated sugar, brown sugar and vanilla. 3. Measure flour, baking soda and salt into sifter. Sift into chocolate liquid. into 30 foil liners and then bake for 15 minutes or until tops pop back when pressed. for a dark chocolate taste. Beat in cream for 1 minute. 5. Frost cupcakes when completely cooled. This recipe also makes a three layer cake. These cake pans are incredible and I have never found better ones! 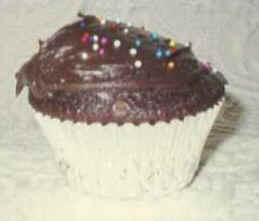 Call Jane's Cakes & Chocolates 1-800-262-7630.